With this plug-in ViewerII creates additional diagrams that are not available in the regular Data analysis set. All available diagram types originate from customers’ requests. If you have any idea for an expressive and / or meaningful visualization of track data, feel free to ask BIOBSERVE for implementation. In the sketch on the right you see regular position data, plotted on a snapshot of the experimental arena in a flat x / z koordinate system. The y-axis is used as time line. 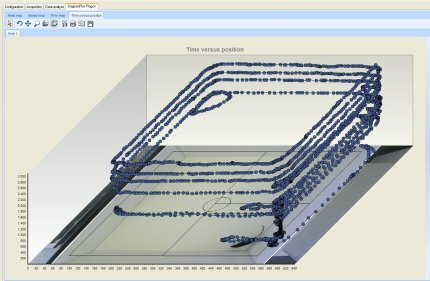 The animation below on the left is a succession of visualizations. They all base on the same data. The diagrams show so called heat maps. Those maps pronounce places with long resting time, or in other words, whereabouts frequencies. There are already some more diagrams available (like velocity profile) and we are eager to hear or read your ideas.